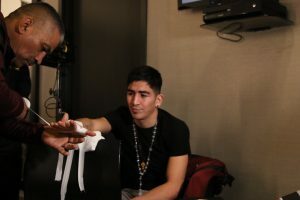 WBA Super Featherweight champion Leo Santa Cruz (35-1-1, 19 KOs) put on a dominant performance as he completely outclassed Rafael Rivera (26-3-2, 17 KOs) tonight. In the opening round it seemed as though Rivera was going to make the champion work for his victory. Rivera connected with several shots which caught the attention of the champion. It was as if Rivera was saying this won’t be an easy night. From there however it became one way traffic as Santa Cruz dominated. The champion hit his opponent whenever he wanted and mostly stayed out of harm’s way. Rivera was game and continued to throw heavy shots but it was clear that he was just simply overmatched tonight. All three judges were in agreement as they gave Rivera just one round while scoring the contest 119-109. Although the main event turned into a contest that was never in doubt, the co feature was anything but. John Molina Jr (30-8, 24 KOs) lost a fairly wide decision to Omar Figueroa Jr (28-0-1, 19 KOs). The final scores of the bout were 99-91, 98-92 and 97-93. The large margin of victory was not indicative of what actually happened during the contest. Things started off as an actual boxing match between the two with Molina Jr trying to use his reach to his advantage while Figueroa Jr was looking to counter. The third round is where we really saw both men pick it up and begin the slugfest that we all were expecting. The sixth round gave us a ton of action as Figueroa Jr seemed to shake up Molina Jr with a right hand. The round ended with both men trading plenty of punches. The rest of the contest saw both men land plenty of hard shots as it turned into a nip and tuck affair. Figueroa Jr managed to escape with his hands raised but the scorecards by all account should have been much closer. With both fighters suffering long spells of inactivity they both showed tonight that they are ready to put that behind them and challenge the best at the Welterweight division.